The Juniper Networks Wireless LAN Access Point, WLA532 is an indoor mobility access point that provides enterprise customers, such as those in business, healthcare and education, with 802.11n-based wireless LAN access in high-density deployments. The device is a compact, hexagon-shaped access point with dual radios with multiple input multiple output (MIMO) supporting up to three spatial streams on each radio. 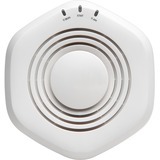 Up to 450-Mbps transmission-WLA532 3x3 spatial stream access point can support data rates of up to 450-Mbps in a 5-GHz band with 40-MHz channel bonding and a short-guard interval. On a 2.4-GHz band with 20-MHz channel width, the access point supports up to 195-Mbps by default with standard guard-interval and supports up to 216.7-Mbps with short guard-interval. In-band spectrum monitoring and network spectrum mitigation-The access point supplies in-band RF-detect functionality to include spectrum analysis to detect and classify the non-IEEE 802.11 sources of interference. Rate adaptation feature with 3 spatial stream (SS) rates, 2 spatial stream rates and 1 spatial stream rates-The access point supports 3 SS, 2 SS and 1 SS rates and provides and full support for rate adaptation with 3 SS clients. One 2.4-GHz radio-One 2.4-GHz IEEE 802.11ng radio that supports 3x3 spatial streams and is backward compatible with 2 SS and 1 SS radios. One 5-GHz radio-One 5-GHz IEEE 802.11na radio that supports 3x3 spatial streams and is backward compatible with 2 SS and 1 SS radios. One 10/100/1000Base-T Gigabit Ethernet port-One 10/100/1000BASE-T auto-sensing Gigabit Ethernet port with an RJ-45 connector to connect the access point to a wireless LAN controller or switch. Power over Ethernet (PoE) on the Gigabit Ethernet port-Power consumption within IEEE standard 802.3af power on the Gigabit Ethernet port. This feature reduces power consumption.